In the hope that a positive review will see hotels inundating us with offers to sample their wares, here is a bright and breezy, rose tinted review of The Angel in Midhurst, West Sussex. A quaint hotel in a quaint town! 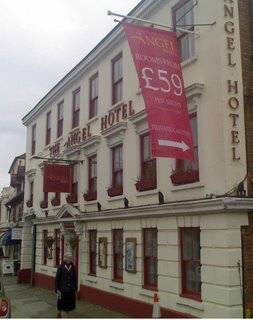 I like hotels with a story and The Angel has one, finding its roots back in the 16th Century at a pivotal time in the history of the town. The room was very cosy. Not in the polite way of saying small, but in the wood beam and comfy furnishings sense. The staff dealt with our non-feather needs without fuss. A nice touch was a sort of landing-come-sitting-room with a selection of books and magazines for you to take to your room. At least, I think that was the idea. If not, apologies if any of the other rooms were looking for Cosmo, The Economist 2006 Preview or BoatBuyer. Even on a Sunday night there was a fair selection of places to eat. It's not my style to scoff dinner in the same hotel as I'm staying (I like to explore), so MissClick and I took to the streets. Unfortunately, we couldn't review all the restaurants in one evening, but the range was fine- from Prezzo (you can see through the big windows), through the Spread Eagle (posh nosh where you can just see through the windows if you put your nose against them) to The Gaudi (so posh, you can barely see through the windows- and dammit, we tried). Breakfast in bed was inclusive which was a bonus. Hotels usually take the liberty of sticking upwards of five pounds on for that. We only stayed for the one night of R&R, but Midhurst kept us out of mischief for a night and morning, and had much to offer in terms of seeing the castle, market square and the various locations HG Wells lived at and worked around the town. The rest of West Sussex and Hampshire, if not London, are within striking distance for longer stays.